I was living in Canada at this time of this trip and then I measured driving distances in kilometers (km) but in this document the corresponding miles will also be given following in brackets. Queen’s Quay, York Quay, CN Tower, met LP for supper before going to the WNED Preview Reception at Hilton Hotel. Although our main destination was St. Jacobs I wanted to show Alice as much as possible on the trip. We drove out Burnhamthorpe Road to the Fourth Line then north, winding across Sixteen Mile Creek, and on to Milton and Springridge Farm. From here we drove through Campbelltowne, then along ON-401 to Kitchener/Waterloo. We went past our old house on Filbert Street, then over to King Street, through Waterloo and out to the Farmers’ Market at St. Jacobs. From here we went to Elmira and on to West Montrose to see the covered bridge, before returning home via Guelph and Georgetown for a BBQ supper. Had a relaxed day with simple meals. Drove into Oakville for a couple of hours for Alice to take pictures around the Yacht Club and harbor area. About mid morning we drove into the city, parked at the multi-level parking station opposite Queen’s Quay, where we had our lunch. We walked along the waterfront for some distance, then decided to do a harbor cruise. Our tour was booked for 4 o'clock, but there was a change in the weather and some doubt about the cruise going schedule, Go it did, but the operators decided it would be the last cruise for the day. We met LP after work as he wanted to take us on a walking tour of the University of Toronto campus (this I should like to do again in good weather and at a nicer time of year). This morning, being the last Tuesday of the month I had Seniors’ Bingo at South Common Mall. The rest of the day was spent making preparations for an early departure the following morning for our next trip! Alice made a lovely supper - Lemon Chicken and Fried Rice - whilst I organized packing. Alice and I were off on another trip, a quite different one from that out west - a different type of scenery and more heavily populated. First, however, we had two appointments in Rochester, NY. We got away from home by 7:45, crossed the US border at the Queenston/Lewiston bridge and were at our first appointment with a distant relative, Bob, at 11:30. We had a pleasant visit and we both got our copies of his book on the history of Rochester’s Clothing Trade (A brother of Alice’s and my Great Grandfather lived in Rochester and two of his three sons were involved in the clothing trade there). Upon leaving Bob, we had time to go to lunch before going to Marcia (no relationship, but an aunt of some friends of hers had married one of the above three sons). We spent a most interesting afternoon with Marcia, and it was already after 5 o’clock when we left. The day got darker earlier than when we were out west so we could drive for only about 1½ hours. Wanting to spend some time in the Finger Lakes area the next day, as well as going on to Corning, we decided to drive as far as Geneva, stopping at a Daystop Motel near the New York Thruway just north of Geneva. I guess that Alice and I were such great talkers, always thinking of something we wanted to tell each other or sharing a laugh, that it took us a long time to get on our way. Although it was 8:40 when we left the motel, we were at the Cayuga State Park on the shores of Lake Cayuga, one of the Finger Lakes, by 9 o’clock. From here on we made many interesting stops along the way. I noticed an unusual monument off to the side of the road - it was at the entrance to the Canoga Cemetery and was that of a famous Indian, “Red Jacket”. We stopped for Alice to take a picture of the site of an Indian village and again in Canoga. There were many Historical Markers along the road about Indian battles and treaties. Our next stops were at the Knapp and Hosmer Wineries, on the Finger Lakes Wine Trail, and we tasted and bought wines at both places. We arrived at Taughannock Falls State Park at 11:45 and, although it would mean our having a late lunch in Ithaca, I was determined, on this trip, to walk the trail to the base of the falls, which is at the end of a mile long glen. It was a beautiful walk along Taughannock Creek, sometimes passing under canopy of trees, and we were fortunate enough that quite a lot of water was coming over the falls. Before leaving the area we drove up to the Taughannock Falls Overlook, from where we could look down over the cliffs and see the trail at the head of the glen. On our way again at 1:35, we arrived in Ithaca 20 minutes later. We bought submarine sandwiches for lunch at Short Stop (had been here before with daughter in 1988). On our way up University Avenue we stopped at an old cemetery, having noticed a mausoleum built into the side of the hill. We sat on a park bench in the Cornell Arboretum to have our lunch, after which we did a driving tour of Cornell University Campus. (This was something which Alice wanted to see because at one point, she had considered taking a summer course at Cornell). CORNELL UNIVERSITY , on a 745 acre campus, located on the north east side of the City of Ithaca, and overlooking the city and Cayuga Lake, is nestled among woodlands, gorges and waterfalls. Places of interest include Triphammer Bridge, with its view of Fall Creek Gorge, and the Cornell Plantations - a museum of living plants: arboretum, botanical garden and natural areas of Cornell University. Plants native to New York grow in the wildflower garden and arboretum. The day was slipping away far too fast, and once again I told myself that I would have to return to this area again! After leaving Cornell University we drove out of Ithaca on NY-79 east to the Six Mile Creek Vineyard as we still wanted to take some wine to Zelda and Frank, my friends in New Jersey. My request for a red wine suitable for Sangria did not go over very well!! 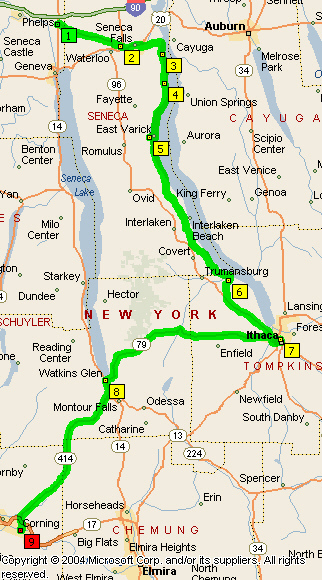 From here we returned to Ithaca to take the road to Watkins Glen located at the southern end of Seneca Lake. We spent almost an hour in Watkins Glen, having discovered Watkins Glen State Park. Next time (!) I come here I want to climb to the top of the glen. On leaving Watkins Glen at 6 o'clock we proceeded directly to Corning, arriving at the Days Inn there half an hour later. We unpacked the car, then went to Market Street as I wanted to buy some tatting cottons at the Golden Unicorn. We then bought some take-out food, which we took back to the motel for our supper - the end of a really wonderful day. There was no need for us to try to leave early this morning because the Glass Museum didn’t open until 9 o’clock. We stopped at the Post Office for stamps after leaving the motel shortly before nine. Alice really enjoyed the Glass Museum so the 2½ hour visit was well worthwhile. On each of my visits the Glass Museum time is limited! It seems that throughout my travels I have this insatiable desire to return to places and see and learn more! We left Corning on NY- 17 east, turning south on US-220 at 12:24 (57.2 km - 35.5 miles), immediately crossing into Pennsylvania. We followed the beautiful Susquehanna River valley, first on US-220 to Towanda, with its long main street, attractive courthouse, and many lovely houses and churches. Towanda was the boyhood home of composer Stephen Collins Foster and the home of staunch Lincoln supporter, David Wilmot, who founded the Republican Party. At 1 o’clock (87.7 km - 54.5 miles) we turned on to US-6, crossed the Susquehanna River, and ten minutes later, pulled off to the side of the road, overlooking the valley, to have our lunch. Continuing on we saw a sign for “Marie Antoinette” Scenic Overlook and decided to investigate the reason for such a name. The Overlook affords an excellent view across the Susquehanna River valley and the location of French Azilum (Asylum), which was founded in 1793 as a refuge for French nobility fleeing the revolution. About 50 log buildings were erected, but after Napoleon’s pardon many emigrants left the area. We left Marie Antoinette Overlook at 2 o’clock and continued on through Wyalusing (since 1752), Tunkhannock (beautiful homes, a sign reading “Sullivan’s March” - camped here 1779), where US-6 left the Susquehanna valley and turned east towards Scranton. In downtown Scranton at 3:20 we decided that we had to stop dilly-dallying and get onto the freeway. Unfortunately directions and signs were not easy to follow and we finished up on the wrong route going south-west. We took a couple of side roads, rather than return to Scranton, and reached I-380 just after 4 o’clock and I-80, in the heart of the Pocono Mountains, by 4:25. As we turned east on I-80 I noticed the gap in the mountains and recognized it as the Delaware Water Gap, even though we still had another 29 km - (18.0 miles) to travel before reaching “The Gap”. We stopped at the Delaware Water Gap National Recreation Area Visitors Center for nearly half an hour. I walked down to and along the bank of the Delaware River for a short distance. I was amused by the sign for the outdoor (after hours) toilets - “Pocono Potties”!! I was reminded of the “Peepee Teepee” at the Bar T 5 Ranch in Jackson Wyoming! 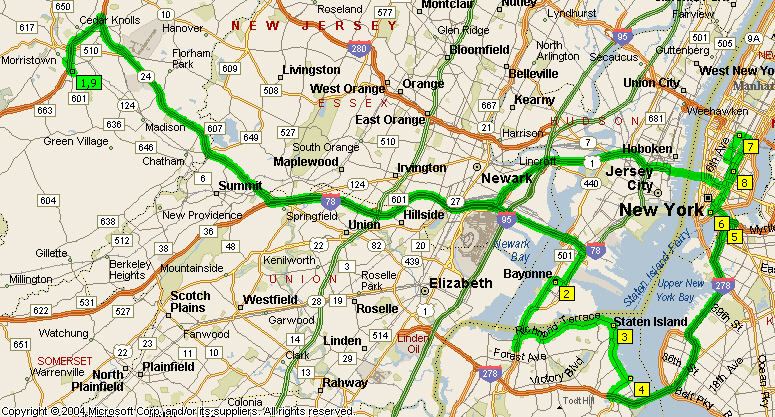 We left the Delaware Water Gap at 5:05, continued along I-80 to I-287, exiting at Exit-31 at 6 o’clock. We arrive at Zelda’s and Frank’s five minutes later. If (!) we wanted to we could have been on a freeway within five minutes from home, stayed on freeways all the way, except for the last five minutes at their end. Whenever I visit New Jersey Frank is always most generous with his time and today was no exception. He also usually comes up with something new. Instead of driving over the George Washington Bridge or taking one of the tunnels under the Hudson River, Frank took the Bayonne Bridge ( http://en.wikipedia.org/wiki/Bayonne_Bridge) to Staten Island. Parking was easier here and we were still able to do the return trip on the Staten Island ferry between here and the southern end of Manhattan. The statue was presented to the United States by France in 1884 in commemoration of the two countries’ alliance during the American Revolution, Measuring 151 feet high on a 156 foot high pedestal, it is the tallest statue of modern times. I stood in front of the house and by revolving on the one spot I was able to photograph this delightful Victorian house, the southern end of Manhattan, and the Verrazano Narrows Bridge across the entrance to New York Harbor. We did a brief tour of the of the house, and I took a picture an of enlargement of one of Alice Austen’s photo of the Verrazano Narrows before the bridge was built. 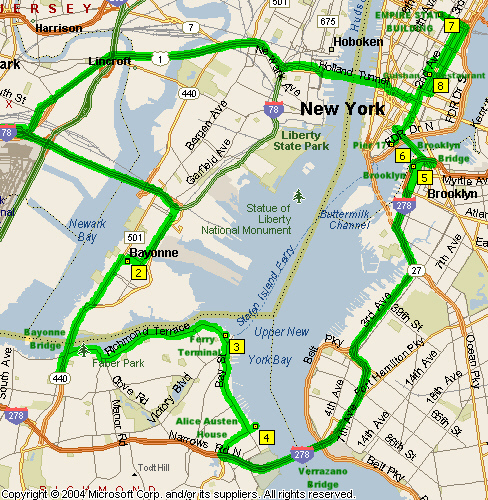 We left Staten Island by driving over the Verrazano Narrows Bridge to Brooklyn. We parked the car in Brooklyn Heights and walked along Cadman Terrace, overlooking the East River and affording a good view of Piers 15, 16 and 17 and Lower Manhattan. We had lunch at a sidewalk café on Montague Street before driving over the Brooklyn Bridge into Manhattan. Whilst in Lower Manhattan Frank dropped Alice and me off at Pier 17 and he parked the car. We then walked to Wall Street, center of the financial district, and Federal Hall National Memorial on the site of the first US Capitol. Federal Hall contains material pertaining to Washington’s Inauguration, the Bill of Rights and Peter Zenger’s landmark trial in the battle for freedom of the press. Unfortunately it was closed. Next we drove north to Midtown Manhattan to visit the Empire State Building - we tried to time this so as to be there just prior to sunset. 5th Avenue and 34th Street, is one of the world’s tallest offices buildings. Soaring 1,452 feet, it has 2 million square feet of office space. The observatory is on the 86th floor. It was dark by the time we left the building, so decided it was time to make tracks to a favorite Indian Restaurant, “Gulshan Restaurant”, 104 Second Avenue in Lower Manhattan. We had the same waiter who had looked after us in June and he remember us! He even asked Frank if he wanted such and such a wine (same as before). We had a delicious meal which had put a wonderful finishing touch to the day ... until we return to the car! It had been broken into, papers from the glove compartment had been scattered everywhere and the coats and backpack stolen out of the trunk. We were directed to the nearby 9th Precinct to report the break in and robbery. Although there would be no hope of recovering the stolen items, Frank needed a police number in order to make insurance claims. Now, unable to lock ourselves in the car, Alice and I went into the 9th Precinct with Frank. Had we thought of it sooner it would have been neat for Alice, to take some footage with her video camera whilst we were sitting in the corner waiting for Frank. To return to Morristown we left New York via Holland Tunnel, and it was close to midnight when we arrived back at Frank’s. We then went on to Princeton where we did a walking tour of part of the University campus (the university encompasses more than 1,660 acres). The College of New Jersey, founded in Elizabeth by royal charter in 1746, was moved to Princeton in 1756, but was not officially renamed Princeton University until 1896. We were peeping in the door of the Richardson Auditorium in Alexander Hall when a man came out, and we innocently asked if we could go in. He had no objections so in trooped the three of us and we had just sat down when out came the conductor. Here we were in our casual clothes in the midst of a well-dressed audience, listening to an orchestral concert. We realized that there was no escape, as we had already made a big enough spectacle of ourselves! The 1776 meeting of the first New Jersey Legislature occurred in Nassau Hall. Nassau Hall served as a barracks and hospital during the Revolutionary War. During the ebb tide of the Revolution, General Charles Cornwallis’ troops occupied Nassau Hall as they pushed General George Washington ‘s army westward. Early the next year Washington followed up his victory at Trenton by surprising and defeating the British in the Battle of Princeton. Nassau Hall was also the temporary home of the Continental Congress. In 1783 the Continental Congress met in Nassau Hall when mutinous American soldiers drove its members from Philadelphia. During this time the members received the news of the treaty of peace with Great Britain. University Chapel, near Nassau Hall, looked more like a cathedral. Built in 1925, it is one of the larger university chapels in America. The pulpit and lectern, which date from the mid 16th century, were brought from France. On leaving Princeton Frank drove us to Washington Crossing NJ, crossed the Delaware River to Washington Crossing Historic Park, Pennsylvania. The park is dedicated to the memory of George Washington and the 2,400 soldiers who crossed the Delaware on Christmas night 1776 to attack and capture Trenton, then garrisoned by Hessian mercenaries. The buildings were closed but we were able to walk through the park. It was already dusk and our attention was drawn to the many geese flying overhead. From Washington Crossing we drove north on the Pennsylvania side of the Delaware River to the picturesque town of New Hope, Frank took us for a stroll along the canal, where the canal crosses over the river. We stopped in at Gerenser’s Exotic Ice Cream, before returning to the car and heading for home. We went back into New York City, but this time, because the car window was still broken, Frank drove to the Park-n-Ride in Union City NJ. From here we could take a bus through the Lincoln Tunnel to the Port Authority, Midtown Manhattan. We started the day off by taking the subway north to 110th Street and walking to Cathedral of Saint John the Divine. Before going into the Cathedral we spent some time looking at the sculptures around the Peace Fountain by Greg Wyatt. CATHEDRAL CHURCH OF SAINT JOHN THE DIVINE in the City and Diocese of New York is the Seat of the Bishop of New York and Diocesan Mother Church. Built entirely of stone, including Maine granite and Indiana limestone, St. John’s is 2 football fields long and 17 stories high. The largest Gothic structure in the world, the Cathedral’s interior measures 601 feet, and the vaulting of the Nave is 124 feet. The width of the Nave is 146 feet. The cornerstone of the Cathedral was laid on December 27, 1892. The West towers, the transepts, and crossing have yet to be completed. The Cathedral is the work of two architects. The East End was designed in the Romanesque - Byzantine style by C. Grant LaFarge between 1887-1911. The Gothic Nave and West Front are the work of Ralph Adams Cram 1911-1941. The carvings of the west front serve to alert the visitor to the wealth of carving to be found throughout the Catherral. One also becomes aware of the many uncarved stones and empty niches, all of which offer opportunity for future donors and for sculptors yet unknown. The receptionist in the Cathedral’s narthex told us we should have been there the previous day. 8,000 people and pets had attended the special mass, The Eighth Annual Feast of St. Francis Celebration. Join 6,000 people 2,000 pets, a llama, an elephant, horses, a panther, an eagle, a hedgehog, pythons, a tuatara, several hundred pigeons, several billion microbes and more, to celebrate the 766th Birthday of St. Francis of Assisi! The receptionist also told us that not a single animal or bird had defecated in the cathedral. We took the subway south to 72nd St. because one of the things that Alice was most interested in doing was walking through Central Park. We walked from Strawberry Fields to Bethesda Terrace, past Conservatory Water to Alice in Wonderland, then, past Central Park Zoo, all the to the south east corner of the park. CENTRAL PARK, extending from 59th to 110th streets and from 5th Avenue to Central Park West, contains 840 acres of wooded and landscaped grounds, lakes, two outdoor skating rinks, a swimming pool and a carrousel. The 2½-acre Strawberry Fields garden of peace honors John Lennon. We walked past Grand Army Plaza to Rockefeller Center, then over to Grand Central Station, where we again took the subway. Our destination this time was near Canal Street - a French restaurant, about which the receptionist at the Cathedral had told us. It was a little more expensive than we had anticipated, but the food was wonderful and the atmosphere great. Back on the subway we returned to the Port Authority to take the Park-n-Ride bus to NJ to pick up the car and go home. We had had another wonderful day. Again Frank was our driver. Also we did some traveling by public transport, Park-n-Ride bus into the Port Authority and the subway to various points in Manhattan, returning to the Park-n-Ride bus back NJ. Although Alice and I were setting out today for our return trip we did not get an early start. It was 10:45 when we left and we followed Frank in his car for 12 km (7.5 miles) to TOPS, a large electric outlet, for me to purchase LP’s tape recorder (a small portable one for him to be able to record his music lectures). We left TOPS a 11:35 and were on I-80 15 minutes later. As we planned on following the Hudson River north, I wanted to take the opportunity of seeing the Palisades. We left I-80 to follow the Palisades Parkway and drove down the rock face at Englewood Cliffs to the river bank. From here we had good views of the George Washington Bridge, framing Manhattan, and, on the opposite bank, the Henry Hudson Bridge over the Harlem River. Between here and the next boat basin (Alpine - opposite Yonkers) we motored along the beautiful Henry Hudson Drive, under a canopy of trees. We returned to the Palisades Parkway a short distance from the State Line Scenic Lookout, with great views of the river valley and beyond. After leaving from here we soon exited from the Parkway onto US-9W and at 1:40 (91.1 km - 56.6 miles) we crossed the border from New Jersey into New York. We took a half-hour break in Haverstraw to have a late lunch, then went on to West Point, where we considered doing a bus tour of this world famous military academy. However, the almost hour-long tour didn’t start until 3:30 and we really couldn’t afford the time. As we left we discovered that we had to drive through the West Point campus to return to US-9W and could stop at a viewpoint looking back over West Point. We drove through Cornwall, founded 1788, and Catskill, just north of which we stopped at Seamon Park, with its magnificent display of color. I don’t think that I have ever seen such a show of mums anywhere before. We had a brief break at Coxsackie for a drink and reached Albany, Capital of New York State, at 6:40 (297.7 km - 185.0 miles). It was our intention to find a motel north of the city so we could get a good start the next day without too much worry about the morning traffic. Well, we got through the “spaghetti junction”, the name Alice gave to an area on a freeway where there were many exits and entrances and highways crossing over highways, and nearing the exit for NY-7 I asked Alice if I needed the east or west. We exited and I drove quite some distance by which time I thought that we should have reached our next turn off, and there was no sign of any motels. It became apparent that we were going in the wrong direction. In the mean time it had also become dark, so we decided that we would spend the night in the next town. Here there had been a very bad accident and ALL traffic was being detoured around the town! We continued, not really knowing where we were going, but we were making progress - somewhere!. Then we ran into a traffic jam the result of another accident and a half hour hold up! Eventually we were under way again and within minutes crossed the border into Vermont(!!). Apparently we were very lucky to be able to be able to get a room in Bennington, as it was the height of the tourist season for fall colors. We unpacked the car, then went for supper at a Chinese Restaurant, during which time we re-assessed our situation. We decided to scratch our plans to go to Ottawa and to take advantage of the mistake we made. Vermont is well known for its display of fall colors and I decided there was no need to go to Ottawa and the Gatineau Hills. Upon leaving the Palisades Motel I wanted to go downtown to look at the clock on the corner of the main intersection. Then we went to the Bennington Battle Monument and enjoyed the great views on all sides from the lookout level at the top of the monument. Bennington Battle monument, at the end of Monument Ave., was the tallest battle monument (306 ft.) in the world when completed in 1891. An elevator takes visitors to the top, which provides fine views in all directions. It was already 10:45 when we left the monument, so it was high time for us to head north. We found our way to Silk Road so we could drive through the covered bridge (1840) one of three in the Bennington area. Then we made our way to Vermont’s Historic Route VT-7A, and just before Shaftsbury, chartered 1961, we stopped to look back to the Bennington Monument. 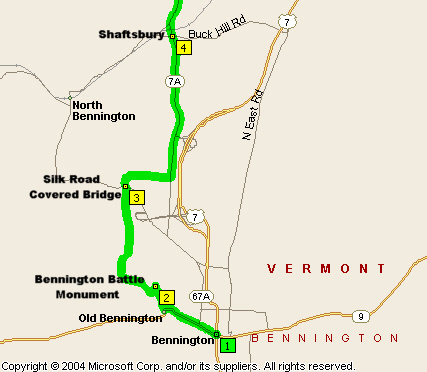 Then it was on to Arlington, which was capital of Vermont in 1787. For our lunch we enjoyed coffee and some tasty rolls at Jody’s Tea Room and got directions to the Norman Rockwell Museum, where we spent 3/4 of an hour. Visitors entering the museum are welcomed by people who were the child models in many of his pictures. Before leaving the Arlington area we drove out to see the house where Rockwell had lived, now The Inn On Covered Bridge Green. Here also was an 1804 church and a covered bridge. As we continued north we noticed interesting scarecrows and decided to investigate. It was “The Pumpkin Patch” at the Equinox Valley Nursery, located 2 km (1.2 miles) south of Manchester. A lot of work had been put into the display, which was attracting many visitors, including tourist buses, and I suspect that it is probably an annual display. Manchester, with it marble sidewalks was settled in 1761. We spent 20 minutes in Manchester walking around in the vicinity of the Equinox Hotel (est. 1769). It was a very attractive area and seemed to ooze with history. Just after 2 o’clock (62.7 km - 39.0 miles) we turned onto VT-30 and headed for Poultney. At the drug store here we bought film and beautiful wrapping paper with a blueberry design, and Alice purchased some glass hummingbirds. 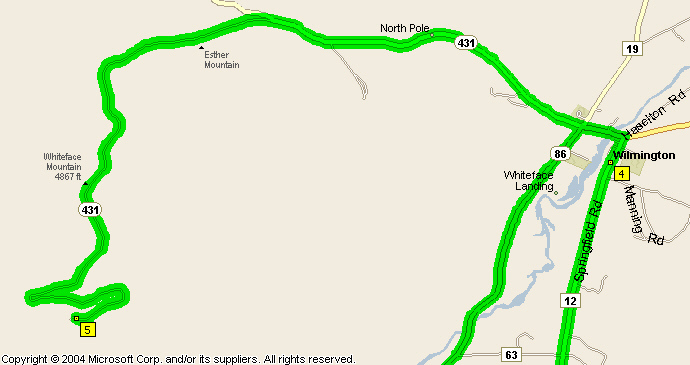 From here we got directions for taking back roads to Whitehall which claims to be the birthplace of the U.S. Navy. Soon after leaving Poultney, and following our unexpected detour to Vermont, we were back in New York State! After a brief stop in Whitehall we entered Adirondack State Park. We pulled into a couple of View Points, one being across to Fort Ticonderoga. We proceeded north to Westport, where we got a room at the Airport Inn Motel on the shore of Lake Champlain. It was just after 6 o’clock. After unpacking we went to the Westport Hotel, where we had a lovely dinner. This morning I felt quite despondent, because, when we left the motel in Westport at 8:45, we couldn’t see a thing through the thick fog. I found driving difficult and wondered whether we should even be on the road! However, five miles down the road (or I should say up the road) as we climbed out of the Champlain Lake valley, we emerged from the fog to enjoy clear skies and a day of sunshine. We had noticed the evening air becoming quite chilly when we were in Bennington and we were made even more aware of the change in seasons as we drove through Keene where heavy frost lay on the ground in shaded areas. We took NY-9N to Upper Jay, then went on a side road which went past the KOA campground, where LP and I stayed with son, Stu, the previous summer. I got permission to drive through the campground so I could show Alice the log cabins and the trail down to the Ausable River. Just after leaving KOA and joining NY-86 we took another look at the Ausable River. Having parked the car I asked Alice which she would prefer - either take the trail to Whiteface’s summit and take the elevator back to the parking lot or vice versa, though I did indicate that the first suggestion would probably be better. The trail up is quite a difficult one and probably be harder to negotiate if descending - Alice realized why I said it would be better to climb up and ride down. Although it was quite cold we spent 1½ hours altogether at Whiteface Mountain. On the way back to Wilmington we stopped outside the “North Pole” for pictures of the beautiful autumn colors, and we stopped again below the ski slopes on Whiteface. We spent the best part of the next two hours in Lake Placid. First we had lunch at a little café with a balcony overlooking the lake, a very pleasant spot from which we watched a beaver swimming around in the water (too far away a photo). We walked along the main street and found a path down to the lake’s edge. It was too bad that “the enemy” was against us in such a peaceful place! It was time to move on. Our next pause was 20 minutes at Tupper Lake ( Pop. 7,000, El. 1,700 feet) for Alice to get a close up view of the resident Canada geese. By this time it was almost 5 o’clock, so our sight seeing had to come to an abrupt end. 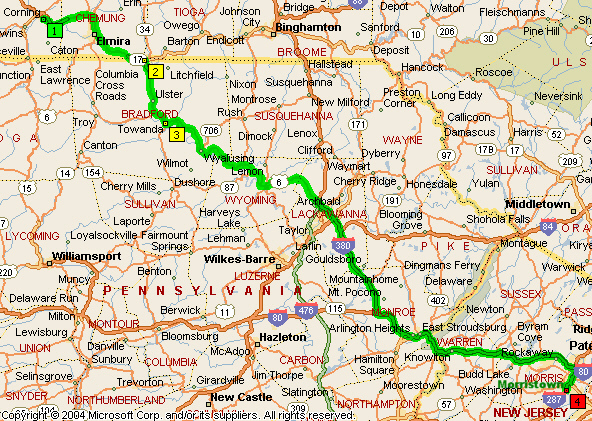 We headed west on NY-3, bypassed Watertown, had coffee at MacDonald’s in Calcium and joined I-81 at 7:00. After crossing the Ivy Lea toll bridge over the St. Lawrence, and being held up at Customs for nearly half an hour, we arrived in Ontario at 7:57 (360.7 km - 224.1 miles) and arrived at Stu’s house in Kingston 40 minutes later. He wasn’t home so we made our way to the Ramada Inn. After checking in and unpacking we went for a walk and had dinner at the Clarence Street Grill. It had been a glorious day, but the cool mountain air had made us tired and we did not need any rocking! What a dreadful day! It was dull and raining and no good for our plans for a Thousand Island cruise. Although very disappointing, we really couldn’t complain because throughout Alice’s entire visit, we had for the most part enjoyed good weather. We had a relaxed morning, but finally decided to drive around Kingston in the rain, which had eased up a little. We found the old houses which had been moved from the library site on University Avenue (Anna’s apartment in Third Year was in one of the houses). The weather seemed to be clearing, so we returned to the Ramada, vacated our room and packed the car, a little more carefully this time because Stu was coming home with us for Thanksgiving and had asked if we could give someone else a ride to Toronto, too!!. We drove east to Ganaoque, but there were no cruises from there that day, so we drove on to Rockport, then returned to Hill Island. Here we went to the top of the Observation Tower, which was half price because visibility was poor!. It did give Alice a bit of an idea, however, of the Thousand Island area. We had a very late lunch on Hill Island before returning to Kingston. As the rain had stopped I decided to take Alice out to the locks at Kingston Mills. It was very quiet and peaceful and some of the trees were in their full autumn regalia. We took a different route back in to Kingston and just had time to stop in at Fort Henry before going to Stu’s. It was 7 o’clock when we set out for home. Alice and I hadn’t eaten as we expected Stu not to have eaten either. We stopped at the first service center for a coffer to tide us over for a while, at least until Cobourg, where we had supper at Caseys. Stu’s friend had to be dropped off in Scarborough, and we did not arrive home in Mississauga until midnight. Today we had our family Thanksgiving dinner, because Stu had to return to Kingston on the Monday. I had invited Alice to stay with us until after Thanksgiving so she could share this Canadian festival with us. It would have been perfect if Anna could have been here too. It seemed as if Alice had only just arrived the week before and now she was packing ready to continue her travels and return to Australia. We still have so much to look at and so much to talk about. Alice departed today after a wonderful visit. It meant a great deal to me to have the opportunity of getting to know Alice so well. We shared many a laugh and both of us could recognize family traits in each other. I would miss Alice very much after she left and wished that we lived a lot closer!